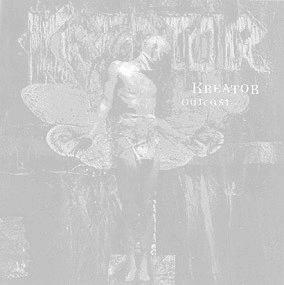 It's been quite a while since we've heard something from Kreator; If there was any band in the 80's that probably deserved more attention it was Kreator. The band is showing a definite wish to be a part of the progressing music scene and with "Outcast" they are releasing some very heavy work with a distinctly 90's theme. Kreator always has been power metal, and this time around they continue to drive the music with tuned down guitars complete with palm muting. With a little touch of industrial in this music, I'm reminded very much of what Die Krupps sounds like on "Odyssey of the Mind". To our dismay "Outcast" doesn't maintain the same adrenaline pumping intensity that Kreator had before. That is not to say that this album doesn't have it's moments, but for the most part the sound has very much been refocused on the merits of a refinement rather than raw emotion. This is also not to say that the album lacks emotion; it is dark, deep, and heavy to the point where the raspy, almost guttoral, vocals blend in without a problem. "Black Sunrise" showcases an original sound that could very much be the beginning of a new breed of doom that will appeal to those not looking for the strong atmosphere that doom normally has. Driving guitars, flowing melody, and raspy vocals continue the often lost track of metal pushed forth by Kreator. This newest recording should please all their old fans and without difficulty garnish quite a few new ones. Extremely heavy and guitar driven, "Outcast" is a definite must for any true metal fan.